Those crazy Koreans and their epic beauty routines! You may already know about the 10-step Korean beauty routine. Step One of this routine is the Cleansing Oil. What is a Korean Cleansing Oil? Cleansing Oils aren't used as much here in the States, but they act as a very thorough makeup remover. Only after the face has been washed with a cleansing oil does the face get washed again with a cleansing water. This is known as double cleansing. Koreans believe that the face has to be completely clean before it can absorb the serums, moisturizers, and masks that come next in the 10 step beauty routine. Those with oily or acne prone ​can rejoice! These cleansing oils are compatible for those skin types too. There are a world of cleansing oils on the market for you to select from. Not only are there cleansing oils, but there are balms and gel-oils. How do you decide which is the best pick for your skin type? We've detailed our top favorites in this article for you! Want to know a little more about what your cleansing oil can do for you? Check out these important features that can help you decide which oil is best for your needs. Korean Cleansing Oils are measured by the number of oz whereas cleansing balms are measured in grams. See how much product you are getting to know if you are getting the best bang for your buck. Cost is always an obvious factor when making a purchase. Are you working with a limited budget? There are great budget options on this list. Is money no object? We definitely have great premium options also! There are numerous oils that are beneficial to your skin. We fill you in on the featured oils used in each product. Below is a little primer on what each oil promises to do for your skin. Not only is olive oil delicious, it also contain antioxidants with anti-aging properties. It doesn't clog your pores and it enhances exfoliation, resulting in fresh, glowing skin. Jojoba Oil is acts as a natural skin conditioner and the oil is completely odorless. Rice Bran Oil is full of antioxidants that protect the skin. It is a super moisturizing ingredient and its a great ingredient for Winter weather. It's light so it's also compatible with oily skin. The Japanese consider it a special anti-aging ingredient. It also helps maintain your youthful glow by brightening the skin, reducing dark spots and smoothing the skin. Coconut Oil is a great natural ingredient for the skin. It works to moisturize and has many anti-aging properties. It also helps the exfoliation process and acts as a makeup remover. There are some that say mineral oil is not the greatest ingredient for the skin. Its a very common ingredient in beauty products and usually included because its a cheap. Grapeseed oil does not clog the pores and has countless skin benefits. It moisturizes the skin, reduces scars, has anti-aging properties, tightens skin, lightens dark under eye circles and more. Apricot is an odorless oil and helps minimize the appearance of wrinkles. It also works to moisturize and heal damaged skin. Geishas treasured camellia oil! It's easily absorbed by the skin and helps to nourish the skin with its healthful anti oxidizing properties. It can also be used as makeup remover. 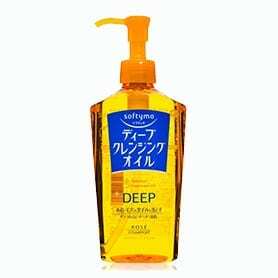 The DHC Deep Cleansing Oil has been one of the most popular Korean cleansing oils for quite a while now. It contains DHC’s unique water-soluble formula that will help you to rinse off dirt and grease from your skin. Moreover, it also includes olive oil and vitamin E in order to ensure that you don’t feel any dryness on your skin. Also, you'll never have greasy residue with this cleansing oil. Now if you're looking for a solution that can eliminate all the dirt, surplus oil, makeup, and other pore-cloggers, then we have found the top pick for you here! The oil spreads and dissolves on your skin quite effortlessly. With a continuous use, you'll see softer and brighter skin. The DHC deep cleansing oil is of the the very best products out there in the marketplace. The Face Shop - Rice Water Bright has a great contender in the Korean Cleansing Oil category. This wonder product can clean up all the dirt and filth and heavy makeup and foundation from your face without any irritation. If you have oily skin, you'll love it's water-based foundation. If you've never heard of moringa oil, it originated from India and has a skin purifying and detoxifying effect. This product is especially great for oily skin! Created by the trusted Etude House, The Real Art Cleansing Oil excels at removing tough makeup while keeping the skin well moisturized. It is lightly scented with lemon so it's perfect for sensitive skin. I love it because it melts off the toughest of makeup! It's a bit heavy so its recommended that you just use it at night, but its not like you should have any makeup to remove in the morning...right?! Just two little pumps can remove all the makeup from your face effortlessly, leaving your skin clean and soft. 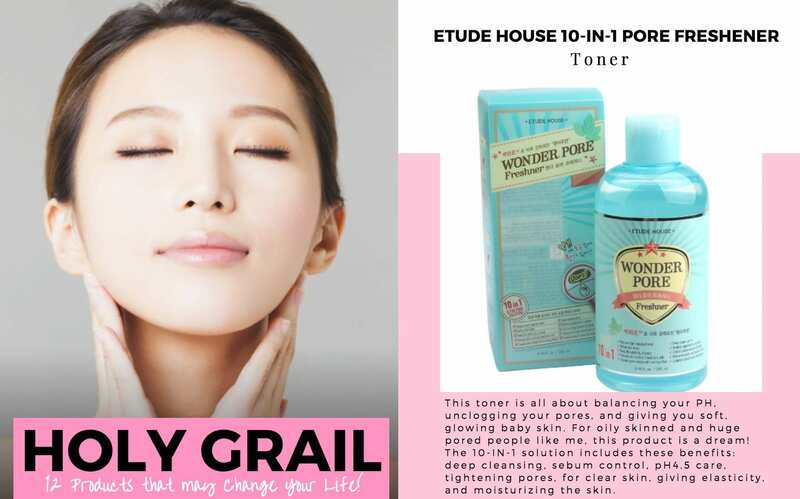 What's also great is that Etude House makes several different oils for different skin types. 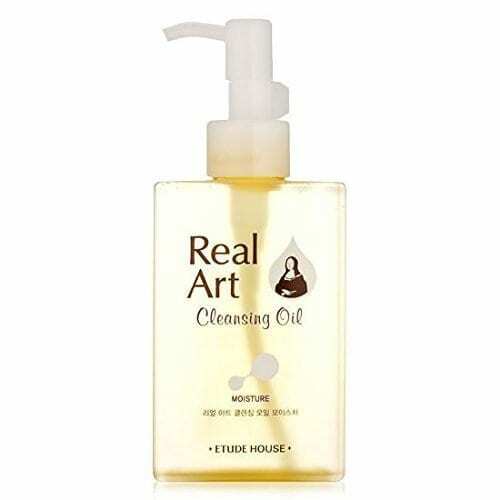 Coconut Oil is included in the Etude House Real Art Cleansing Oil, one of my favorite ingredients, maybe I'm just biased because I love coconut water but it leaves my skin super soft and glowing! 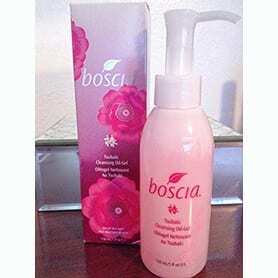 This gel-oil combo product from BOSCIA is removes all the impurities from your skin without disrupting the natural firmness and softness of the skin. Its anti-oxidant formula helps to moisturize the skin and protect it from the oil breakouts. It's the best of both worlds, combining the convenience of a gel with the moisturizing effects of the oil. The lightweight botanical blend of camellia oil keeps the skin firm, hydrated, and protects against any radical damage. Moreover, the anti-oxidant properties works as an anti-aging agent and the added omega 6 and 9 helps to moisture deep into the skin. The other ingredient, the Japanese Sea Kelp helps with wrinkles and firmness of the skin by replenishing protein and increasing collagen. To reduce dark spots and enhance the glow of the skin, the natural rice bran oil was also added to the blend of this cleansing oil. This is an award-winning cleansing oil is perceived by many to be the Holy Grail of cleansing oils. This cleansing product is more of a balm rather than the oil with its solid texture. Even with the solid texture, its pretty easy to apply on the skin and you only need a little bit of the product to clean off any makeup. What’s interesting about the product is its transformation from a solid balm to a silky oil once you apply it to your skin. It can cut through the most stubborn makeup and eliminate the impurities without compromising the skin’s essential oils. This cleansing oil contains various natural ingredients like Papaya Extract and Vitamin C that can make you skin dirt free and glowing. With it's skin enhancing ingredients and vitamins, this cleansing oil is considered the Holy Grail of cleansing oils - check out what all the hype is about! 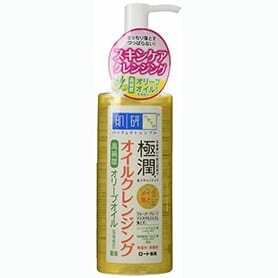 If you're looking for a lightweight cleansing oil, you can’t go wrong with the Hada Labo Gokujyun Cleansing Oil. It's one of best cleansing oils when it comes to consistency. So, if you are not much of a fan of cleansing oils with thicker viscosities, check out this Cleansing Oil (it's from Japan!). You'll love the consistency of this cleansing oil, it spreads and dissolve on your skin smoothly. One pump is enough to get rid of makeup, dirt and clogs from your skin. What's more is this cleansing oil is a perfect alternative for those with sensitive skin as it does not contain any chemicals or fragrance. It’s a highly recommended cleansing oil for anyone who want to clean up their makeup, including foundation and mascara. Simply put this cleansing oil on your skin and eyelashes, massage gently and rinse lightly with water. You don't really need a second cleanser with this cleansing solution. The Kose Softymo - Deep Cleansing Oil uses a combination of rice bran, mineral and orange oils to come up with this groundbreaking formula. The oil helps to melt off the sebum and blackheads from the skin whereas the mugwart extracts work to refine the pores. You don’t have to worry about those harmful toxins from the makeup chemicals since this cleansing oil can remove those toxins thoroughly from deep inside of the pores. 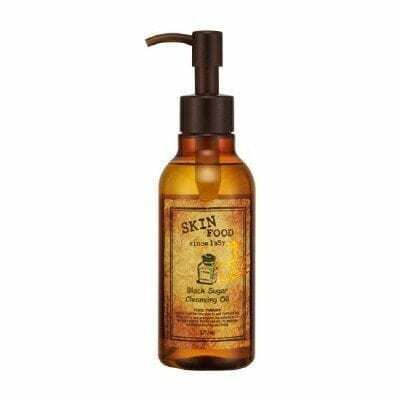 Skinfood has been producing some great cleansing oils for a while now and they have gained renown for their product quality and their efficiency in removing heavy makeup effortlessly. We love that the main ingredient in this product is black sugar. NOM NOM NOM! One thing we noted as frequent flyers: there's clamp under the nozzle that prevents accidental outflow. Great for if you are traveling with the oil in your bag! Just a single pump of Skinfood's Black Sugar Cleansing Oil is enough to remove all the makeup from your face. This oil is super efficient and it spreads over the skin quite effortlessly. This oil contains mineral oil so if you have sensitive skin you might want to do a trial with product before adding it to your regular routine. You can remove your eye makeup without dragging or pulling with the help of this cleansing oil. This oil smells great - like fresh lemons! 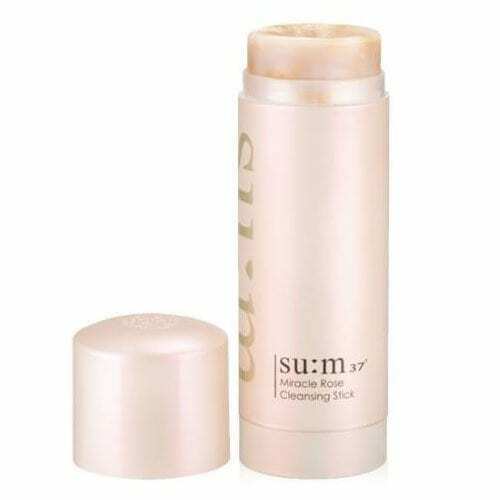 Su:m 37 Miracle Rose Cleanser is a specially constructed cleansing oil that contains fermented rose flower extracts. 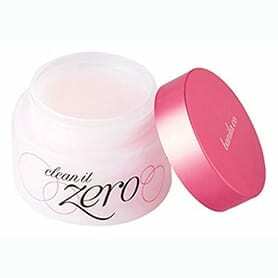 It’s a hypoallergenic cleansing stick that includes naturally blended elements. The exceptional trait of this cleansing oil is its ability to eliminate the impurities from the skin with the support of the combination of naturally blended ingredients. Moreover, it does not contain any harsh chemical that can be considered as harmful for any skin type. It has the fragrance of roses. You can use this cleansing stick in several ways – you can directly apply the stick on a wet face or you can make foam on your hand from the stick and then apply it on your face. You only need a small amount of rubbing or foam for the cleansing process. Thank you so much for the reviews. They help a lot.